The Adventures of Sinbad was an action/adventure series that aired from 1996 to 1998 for two seasons. For a long time it was our very favorite show and we even had two websites devoted to it. Over the years our interest has waned, but the show is still very nostalgic and memorable to us. I really can't speak too much to season 2 because I only watched a few episodes due to the change in cast and the major shift in tone, but season 1 stood alone well enough and overall it was a really fun, cute show. The series centered around the brave and adventurous captain Sinbad and his travels with his crew. It was on around the same time as Hercules and Xena, and while it wasn't as popular as either of those shows (though it did get mentioned twice on Xena much to our delight), there was just something about it that really appealed to us. 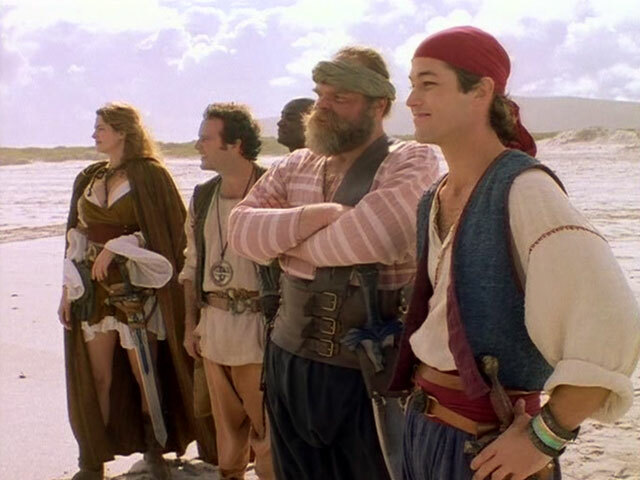 The main storyline of the show was that Sinbad and his crew were searching for his tutor Dim-Dim who was lost to the forces of evil. Along the way they had a number of adventures (and misadventures), and were met at every turn by their nemesis Rumina, who had a love/hate relationship with Sinbad. His crew consisted of his protective older brother Doubar, absentminded inventor Firouz, independent sorceress Maeve, strong and silent Rongar, and a mysterious hawk named Dermott. The best part of the show was the chemistry between the characters and the humor. Although most of the dialog and special effects were cheesy, that was just part of it's charm. The relationship between Sinbad and Maeve was also a huge draw for us and for many other fans of the show at the time it was on. Something about this series just really inspired us - we learned how to create a web site so we could have one for the show, we wrote a lot of fan-fiction, made a ton of fan-art and montages, and the first autograph request I ever wrote was to Zen Gesner. Looking back, I'm not sure what it was about the show, but it just struck a chord with me and I also made a lot of great friends on the AoS forums and had a lot of fun chatting about the show and sharing fan-fictions with them. Despite it's charm, the show was not without issues. The characters, although they were endearing, didn't really have many meaningful scenes together or special character moments. Even with the show having 22 episodes in the first season, they didn't really grow or change much between the first and last episodes, so they ended up coming across as somewhat one-dimensional. The second season also destroyed that special appeal that the first season had. The characters were just missing that spark that they held in season 1, and it was completely unacceptable that Sinbad rarely ever mentioned their lost friend Maeve when she had been such an important part of their crew. I was also very disappointed that the finale of season 1 left off with such an interesting storyline with Turok's return, and neither he or Rumina were included in the entire second season. It just felt like a completely different show and ended up dividing the fans. I really enjoyed this era of shows in the 90's with Sinbad, Hercules, Xena, Tarzan, Robin Hood, and all the other historical fantasy action shows. Sinbad may not have been the best or the most popular, but for a long time it was my absolute favorite show. Although I don't rewatch it very much, I still have very fond memories of the series and especially of the fandom that existed at the time. This series of fan-fiction was written by fans of the first season of the show who wanted to see the story continue on from where "Vengeance of Rumina" left off, instead of the direction the actual series took. It was put together by us and a bunch of our friends back when the first season had completed. Note: The NEW Adventures of Sinbad has been archived on AO3! Please click here to view the collection.